In the world of Microsoft Windows when things hang up and freeze we can often get out of trouble by pressing the all so familiar key combination, Ctrl+Alt+Delete. Once we get our program menu open we can force close the frozen application and hopefully continue on like nothing ever happened. Just like any computer Macs freeze up too, and just like with Windows, it’s often because of a locked up or frozen application that needs to be closed. OS X has a similar key combination that will bring up the force quit menu and allow you to easily force quit any misbehaving app. Command (Apple Key)+ Option + Escape (Esc) all at the same time. 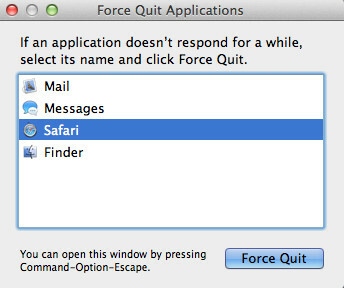 * Alternatively, you can also force quit applications on the Dock by Control Clicking (Right Clicking) a running app to open the menu and then by pressing the Option Key to reveal the Force Quit option.